A Nightmare on Elm Street. New Line Cinema 1984. I don’t necessarily favor special holiday editions of everything. In fact, I avoided doing anything special for Christmas and New Year’s last year. This Halloween, I’m in the mood to catch up on some horror classics (but only the classics), which happen to be ripe YM fodder in that they’re old and they’re fresh to me. “Nightmare” is the earliest horror movies to attract my attention. Dreams, telepathy, and pushing the limits of the mind has always been an interest of mine. A psycho who kills by entering your dreams is one of the scariest fantasies I can think of, forget the fingerblades. 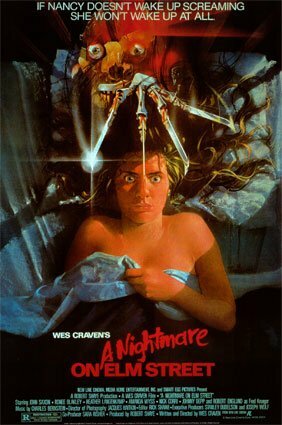 Nancy Thompson’s friend Tina has been having nightmares of a murderous madman with knives for fingernails, and is too afraid to sleep alone. Tina and Nancy have a sleepover and their boyfriends crash it. That night, Tina is horrifically murdered and the police suspect her boyfriend. Nancy isn’t so sure, because she’s been having similar dreams. The adults won’t listen to her, and only insist that she stop avoiding going to sleep. Even when she can identify the man, they won’t listen, because they know he’s dead. But Freddy Krueger is still deadly in the realm of dreams, and only Nancy can fight him. I am honestly disappointed in my reaction to this film, and I’m not sure if I can blame the film, the 24 years since its release, or myself. I could not get scared by this movie. I even turned off the lights when it wasn’t working, and still the best I could manage was taking it seriously, most of the time. Everything that was supposed to be shocking was either gross or comical. The parody of this movie that The Simpsons did was scarier. I suppose it’s well-written, but it’s one of the most annoying types of plots there is: the kids are onto something, but the adults are too closed-minded to listen. Nancy tells her father that Fred Krueger is the murderer, and her father, who knows that Krueger was a child killer, that Krueger is dead, and that nobody told Nancy about Krueger, shrugs it off as madness. I accept that characters who have no reason to believe in the abnormal should be reluctant to acknowledge it, but idiocy is not plot. As Nancy, Heather Langenkamp screams, cries, and chafes at the mishandling the adults give her. I can’t say much more about her acting, other than that I blame her overacting on the script and not her. Tina had the narrative proximity reserved for the protagonist up until she died, which I suppose was intended to make her death more meaningful. The main thing I thought about it was that, of the two girls in the story, the prettier one was the one that didn’t survive the first 20 minutes. I couldn’t look at Nancy and not think she had a homely face until around the time her boyfriend died. I think the reason I had such a poor response to this movie was ultimately because of all the horror parodies I’ve seen. Scream creeped me out more, and I first watched that film over lunch! I can’t blame “Nightmare” for sticking to the formula, because it wasn’t overused at the time it was made. I can, however, blame it for the end, which is more than a sequel hook, but less than a proper cliffhanger. Watch this film: alone in bed with the lights off. The scare factor can’t be helped any more than that. Don’t watch this film: if pre-digital effects make you giggle.